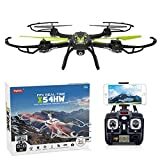 · Features: X5SW RC Drone Built-in WiFi Camera and Electronic Compass, WIFI real time transmission for videos and photos between built-in camera and mobile attached to the remote controller. Both of Android mobile phone and Apple IOS mobile phone are applicable for this FPV drone (program is available for downloading and installation). Function: up/down, left/right sideward fight, forward/backward, turn left/right, with gyro/flash lights, A 360-degree 3D and special functions (continuous rolling), real time transmission of video and photos. Channel: 4CH 6 Axis Gyro Main Rotor Diameter: 14 CM Battery para Controller: 4AA batteries (not included) Battery para Quadcopter: 3.7V 500mAh Li-Poly Charging Time: About 120 mins (USB charging) Flying time: About 10 minutes Resolution: 480x640 dpi Dimension: 31 * 31 * 8 cm Notice: The original battery is inside the drone body, and landing gears and mobile clip and screwdriver is placed under the tray. Notice: The original battery is inside the drone body, and landing gears and mobile clip and screwdriver is placed under the tray. In order to ensure the product brand new and can work properly, our staff will conduct product testing before shipment, so maybe the color box adhesive tape is opened.